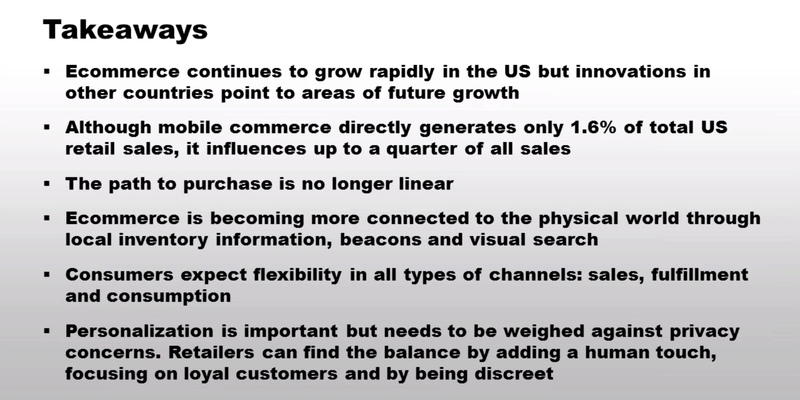 A couple of weeks ago, I attended the eMarketer’s webinar “Key Trends in e-commerce” and thought I would share with you the developments and insights that caught my attention. It’s worth noting that most of the trends covered in this webinar are based off US-centric data. However, with the US being one of the leading countries in all things e-commerce-related, it’s safe to say those changes will soon be happening on our Aussie doorstep – if they are not already in some shape or form. #1. 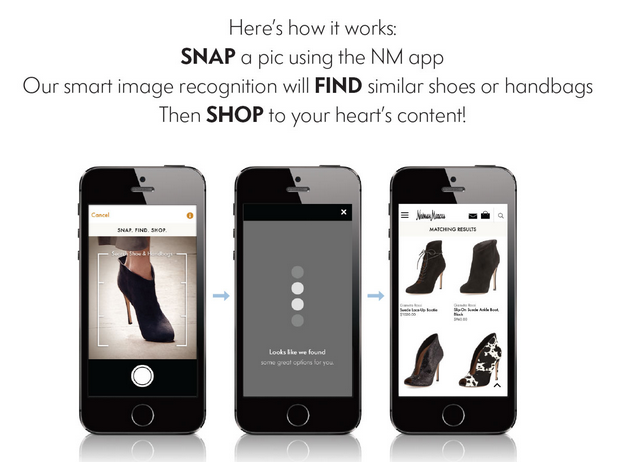 The adoption of beacons and visual search by retailers to bridge the online and offline worlds. #2. Mobile sales may be small in volume and dollar value (at country level and worldwide). Yet mobile browsing is a key driver of sales across channels. #3. Etailers are working hard to bring a human touch online and offline. Happy reading! And as always, I would love to hear your thoughts on new and emerging e-commerce trends to watch over the next few months. 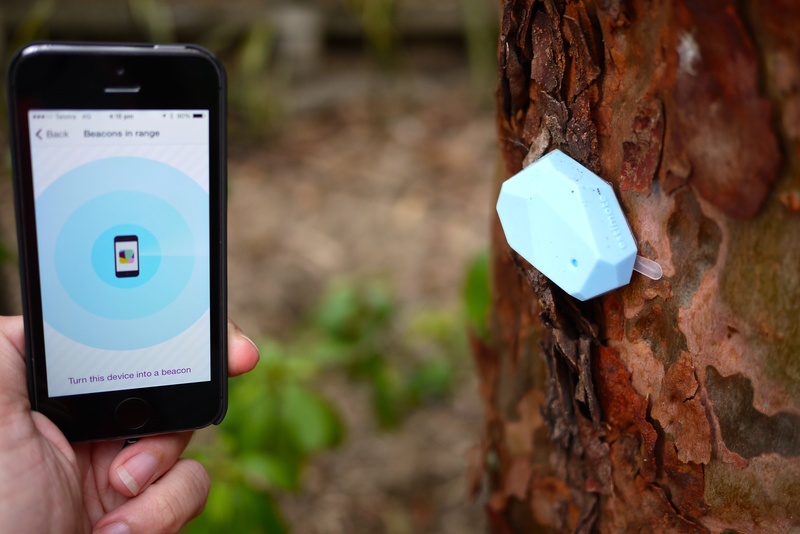 Beacons make it possible to deliver personalised mobile communications at the right time and at the right place to the right person. And amongst the many use cases, beacon-triggered mobile messaging may be used as a way of driving sales off and online (think: e-coupons etc). For those of you who are keen to find out more about how they work, their benefits and other key considerations, you can check out my post on the key need-to-knows of beacon marketing. Compared to beacons, I would argue visual search is still in its infancy, with a much lower take-up amongst marketers worldwide at this point in time. Its future is nonetheless equally promising. Luxury fashion retailer Neiman Marcus is amongst the very few who have started using the technology as a way of generating more sales, with the recent launch of the Snap.Find.Shop feature on its shopping app. Research has shown that tablets and smartphones are often the preferred devices for searching and browsing product information, exploring options, with the actual buying typically taking place on a desktop or in-store. Sales made through mobile devices remain comparatively small as a result. However, for this very reason and as eMarketer points out, one should not underestimate the influence of mobile browsing. Our mobile consumption habits and ultimately their very impact on sales make it critical for marketers to have a mobile presence, commerce-enabled or not. Sadly, there are still too many Australian brands out there (large and small) whose web presence is not mobile-optimised and/or who have no mobile apps either – making the discovery of their products and services through mobile difficult, if not impossible. These brands are missing out and no doubt losing sales to competitors who think mobile first. Online, this human touch may take the form of an online personal assistant or a video chat with a stylist to help with your online shopping as it happens. Offline, pop-up shops are one of the ways established online retailers such as Amazon or Zappos are experimenting with a physical store environment. This allows them to connect with a category of customers whom they would otherwise not reach i.e. those consumers who prefer the warmth of real-life interactions with sales assistants made of flesh to virtual ones, as well as those who like to experience and touch products before buying them. Finally – there is one other trend worth considering, not covered in the webinar as such, yet one to watch in my view. This trend is best exemplified by Burberry or Hointer.com as they both seek to bring the convenience of the online shopping experience in-store, each to a different extent however. Burberry’s London flagship store was the first of its kind when it launched in 2012, and remains one of the best examples of store of the future to this day. Simply, no expense is spared to recreate a fully-immersive online shopping experience in-store, through a blend of interactive multi-media content and state-of-the-art store design. A lot more recent, the Hointer.com shopping experience goes the extra mile in my opinion, achieving a closer “virtual store in a physical world” experience. It uniquely uses mobile technology as the key enabler of its in-store shopping experience end to end, transforming the role of sales assistants as we know it in the process. Now, some of you may argue that Hointer.com is taking it a step too far, that it’s way too cold and mechanic and that it will never catch on. Well, it may be the way you think now as it is a never-seen-before experience after all, bound to take us out of our comfort zone initially. But who’s to say that it won’t be one day the only way to shop in-store? I guess time will tell. What will the store of the future look like? Lately I have been reading about connected homes and connected cars. Whilst I am (very) excited at the prospect of experiencing both in the not-so-distant future, it left me wondering about what connected stores might look like also a few years from now. 3 players stick out for me when it comes to transforming the in-store experience through the integration of information and communications technologies. All 3 are working hard to merge the bricks-and-mortar and virtual shopping experiences into one effortless, consistent and personalised experience. This they achieve not only through a selective use of technologies (mobile or other), but also by observing their customers’ shopping behaviours and adapting the in-store experience accordingly. For Christopher Bailey, chief creative officer of the British luxury fashion brand, the shop of the future integrates behaviours that are inherent to the online shopping experience into the in-store experience. And so in the same way as customers shop online from the comfort of their sofa at home, customers in its London flagship store are shown to a sofa at point of purchase, where they are presented with a swipe machine that swiftly computes their purchase. Other examples of the “digitalization” of Burberry’s largest store include embedding clothes with RFID-enabled chips that can be read by the fitting rooms mirrors, triggering images and videos of the selected garment in catwalk shows or how it was made. Kitting out the store with high-speed lifts to fast track the time it takes for staff to check an item’s availability is one other (this check is instant online). For Howard Schultz, the CEO of the coffee house chain, the store of the future will enable a one-to-one relationship between the brand and its customers through the personalization of the service they receive as they walk into the store. As he explained in a recent interview with USA Today, customers with a history of in-store mobile payments made through the Starbucks app could in future be presented with their usual favorite drink as they are geo-located and id’ed the moment they step through the door – without having to order. For the high-street fashion retailer, the store of the future reconciles the rise of the omni-channel shopper with the company’s ability to connect demand (web, mobile or offline) to supply (wherever it might be also) through its backend systems. This has led the retailer to start trialing the find in-store and reserve-in store features on its shopping app. The app geo-locates you and flags the nearest stores. By connecting to the store inventories in real-time, it shows you the inventory level for a given item and ultimately gives you the ability to find and buy the item you pre-shopped online in a store of your choice. As you go online to shop with GAP, you spot an item you like, you locate it in a store near by and simply reserve it. The item is held for you until the next business day for you to try in store, build a transaction and possibly a whole outfit around it. Unlike pick-up in-store, it encourages customers to stick around as they try things on and build a connection with the staff and brand. In both scenarios, the shopping experience starts online and leads to an offline transaction. No doubt there are more examples in the same vein (feel free to share those you find inspiring!). Burberry and Starbucks however are ones to watch: they have famously (and successfully) broken new grounds when it comes to integrating digital media and platforms into their marketing efforts. And they are constantly looking for new ways to market their products and optimise the customer experience. With this in mind, any one who ever thought the bricks-and-mortar shops would soon be a thing of the past may want to have a rethink. A converted online shopper myself, I could even be tempted to go back in-store. Just read about Woolies’ latest effort with its ”bus shops”. It is encouraging though to see that Aussie retailers are investing into m-commerce. In a further effort to differentiate from its online rivals (Wal-Mart, Amazon, BestBuy) and combat showrooming by having products that can’t be bought elsewhere online, Target has just made 6 new brands exclusive to its online store. This move follows another bold decision by the retailer only earlier this month to offer its customers a year-round online price match. This only shows Target’s ongoing committment to tapping into the ever increasing online shopping uptake as well as its determination to protect its customer base from other online retailers and keep its customers coming back for more as much as possible. Australian retailers may want to take a page from this retailer’s approach but also other US retailers (check out Walmart’s response to showrooming) on how to grow online sales. Personally I am a huge fan of both Walmart and Target’s agile approach in the online shopping space – given their size, their ability to quikcly respond to and embrace consumer behaviour changes is to be commended. Brilliant ad! It makes online shopping so much more interesting – and this is also very true : the best online shopping experience I have ever had with a supermarket was in the UK (not with Tesco but Sainsbury’s, its competitor). Their personal shoppers DO pick the freshest fruits and vegs for you, which was the biggest barrier for me as a consumer to shop for fresh produce online. After trying online shopping with them i never put a foot back in their store. Which makes me wonder…. Could this the beginning of the end for bricks-and-mortar supermarkets? More on this ad here.